As trusted probate attorneys, our clients often have questions about the wills, estate, and probate process. We’ve put together some of the most common questions with our answers right here for your convenience. What does the word “probate” mean? Probate is the act of proving a will. However, over time, it’s come to have a more general meaning of the process of administering the estate of a decedent (the deceased). Decedent: The person who has passed away. Testate estate: When a person has passed away with a valid will. Intestate estate: When a person has passed away without a will. Executor: The person appointed by the court in a testate estate to be the agent for the estate. This person is responsible for carrying out the terms of the will. Administrator: The person appointed by the court in an intestate estate to be the agent for the estate. This person is responsible for administering the estate according to the intestate laws for the state. Personal representative: A general term for both executors and administrators. 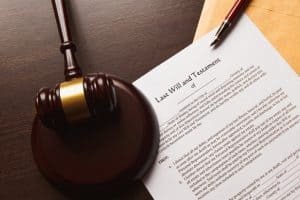 It basically identifies the person responsible for administering the estate either under the terms of the will or the laws of intestacy. Is probate public? Yes. When a decedent’s estate has to go through the probate process, then all court filings associated with that process are public record. With some families, this is a scary prospect if they have controversy or some sort of scandal within the family that they’d rather keep private. However, depending on the terms of the will (if there is one), the requirement to file an inventory of assets could be waived. What kind of fees are involved? If approved by the court, attorney and personal representative fees may be paid from the estate. How long does the probate process take? Estate administration takes several months. There are waiting periods, like allowing time for creditors to file claims. There’s also time necessary to identify all the assets, dealing with creditors and taxes, and other paperwork. Many estates are resolved around six months. Complicated estates can linger in probate for years. However, remember that only an experienced attorney can give you a more detailed estimate about your unique situation. If you have any other questions about the probate process or probate litigation, talk to the Chattanooga probate litigation attorneys at Wagner & Wagner. Our skilled legal team can work with you to ensure the process goes as smoothly as possible. We serve clients in Chattanooga and Cleveland, Tennessee, as well as all surrounding counties. Call us today at 423-799-3532 or complete our contact form to schedule your free consultation. How Does a Prenuptial Agreement Impact Who Can Inherit? How Does Intestate Succession Work in Tennessee? Estate Litigation Is on the Rise – Why?